Relieving this tension could be life changing and does not have to be expensive. Massage therapist visits can get pretty tough on your wallet. There are easier ways of relieving neck and shoulder pain, all of which does not involve spending a fortune. 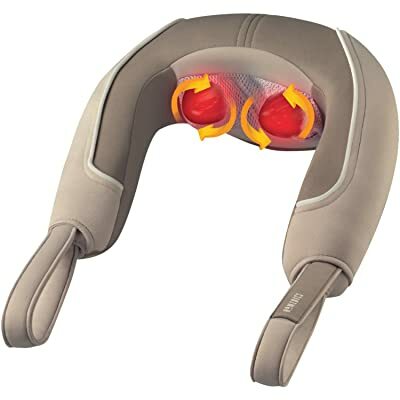 Most popular ways of relieving neck and shoulder tension is by using simple devices such as neck massagers. This machine is specially built and designed for the sole purpose of easing tension and pain in neck and shoulder regions. The wide array of neck massagers available to consumers makes selection difficult. Below is a compilation of the best neck massagers we picked for this year. 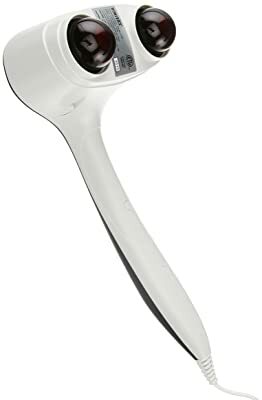 One of the top models out there is Brookstone Sport which comes with ten different levels of rhythmic percussion massage. Furthermore, it has three massaging programs: soothe, pulse and energize. The width between the nodes can be adjusted to fit people of different sizes. It is also capable of being lowered and raised along the back. It has a front handle snap, which gives it the ability to be used hands free. Thos Brookstone massager is designed for home use, it comes with some restrictions. For starters, the machine is designed for adult use only. Pregnant women, patients of diabetes, phlebitis, and thrombosis are advised against using it for fear that it may cause formation of clots in their blood vessels. Whereas individuals with any artificial joints or any other medical devices implanted in their bodies should consult their physicians before using it. Designed for adults only and is not suited for use by children. 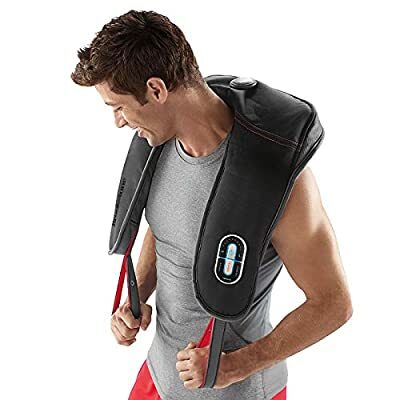 Another model that is designed purposefully for neck pain relief and shoulder tension is the HoMedics NMS-360. 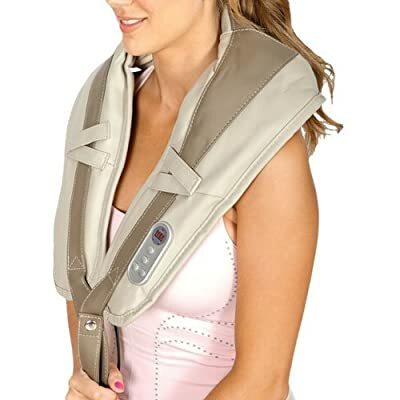 It has three different options: rotating shiatsu, invigorating vibration, shiatsu and vibration combined. The flex handles are used to customize the intensity. It features soothing heat on the back. The integrated control system is used to select between massage and massage with heat combined. The rotating shiatsu does not have the same painful effects of other devices, rather feels like a real physical touch. The materials covering the moving fingers can be abrasive on the skin, while some users have complained that it tends to heat up during use. Another device that makes it to the list of 2017 is the HoMedica Thera-P. It has two massage options, high and low. The Ergo comfort design gives it a perfect fit. Additionally, it has a soothing heat option and an integrated control system. This integrated control is used to select the options available. Compared to other devices on this list, this massager does not put out much heat and does not vibrate as much. Designed for relaxation and soothing sore muscles, the Homeimaged Deep Tapping is another great option to consider. It has 20 multi-rhythmic percussion tappers, which penetrate aching muscles and reduce tightness and ease tension. It is not only for relieving shoulder and neck tension as it can be used to massage any other part of the body including thighs, buttocks, waist just to mention a few. In this sense this one has ten pre-set levels of intensity. It can easily be lowered or raised depending on the preferences and needs of a user. Has over 20 multi-rhythmic percussion tappers to penetrate to aching muscles and deep tissues. Many users have complained about deep tapping, which can be difficult to adjust to and tolerate at times. For people looking for an alternative neck pain relief solution, the shiatsu massage chair is one of the best options. Due to its effectiveness, those chairs has been prescribed to persons with back problems and sore muscles. It can get pretty expensive to get one for a home use, but if you would like to get one visit our homepage to learn our selection of best selling models.